Dogs & Fireworks -- What You Need to Know. Fireworks are unnatural. You don't have a lot of control over when or where the noise happens. Fireworks can screw up a dog faster than anything. It's a lot harder to fix a gun shy or noise sensitive dog than it is to prevent gun shyness in the first place. Sometimes the fireworks start before New Year's Eve or the 4th of July and run a few days after the holiday. There is NO REASON for a dog to be around fireworks, and I do everything I can to keep my dogs away from them. Usually dogs conditioned to gunfire can handle the noise of fireworks, but there really isn't anything good about them as far as dogs are concerned. We sell a couple of products that are designed to help dogs get over the fear of fireworks, but I really prefer NOT to have to sell them. My biggest concern is that a dog will hurt themselves trying to get away from the noise. My second concern is that exposure will create a gun shy or noise-sensitive problem where there doesn't have to be one. 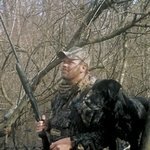 My best gun dog ever, Em, never had a problem with gunfire, but she was so afraid of thunderstorms that we had to build a special top for her kennel run so she couldn't climb out or hurt herself trying. I was at a party a few years back and watched a new dog get exposed to fireworks completely the wrong way. The dog was in her kennel but still in full view of everything that was going on. Once the fireworks started she became more and more upset and wanted out of the kennel. To calm her down they let her out of her crate and she made a break for it. They didn't find her for two days. I do my best to keep all my dogs away from any kind of fireworks. 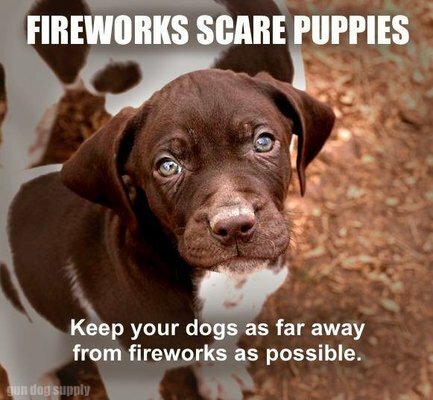 Even dogs that have been properly conditioned to gunfire can become upset or nervous when exposed to fireworks. It just isn't worth it. Fireworks happens twice a year with New Year's and Fourth of July. You might want to condition your dogs to fireworks, especially if you live where your dogs will be exposed a couple of weeks out of the year. It never hurts to check with your neighbors about their fireworks plans. Give them a heads up that you have a young dog and ask them to give you a call before they start. People don't think about fireworks until it's too late, so think about it a little now. The majority of dogs don't have a problem with it, but some do. Why take a chance? No point in stressing your dogs out.